If you’re a homeowner or are purchasing a new home between Columbus and Southport, Indianapolis, you have had to inspect a roof at some point. Perhaps you have inspected it because a storm has passed through or it’s been years since the roofing contractor installed it. Whatever the case, it’s good to know what to look for to determine if your house requires a new roof. Ignoring a worn-out roof will result in water seeping into your home. Major structural damage is also possible if the roof isn’t cared for. It’s easy to spot a worn-out roof, however. Here are nine ways to determine whether you should replace your home’s roof. You may need your roof replaced from a local roofing professional if you start seeing lots of gravel — referred to as “granules” — washing out of or building up in your home’s gutters. The granules appear in your gutters as rain washes them off shingles. They wash off because over time the granules loosen from the asphalt that holds them due to exposure to the environment and damage from things such as hail and fallen limbs. If enough granules wash off your shingles, you may notice bald spots. Bald spots are a definite sign that you need to contact a roofing contractor because, without the granules, your shingles are compromised and lose much of their ability to protect your home. As a note, it’s common for high amounts of granules to wash off from a new roof. This occurs because granules come loose during backing, shipping, and installation. The loss of granules will stop, and it’s no reason to worry. Another sign that you should contact a roofing contractor is that your shingles aren’t lying flat. Curved (“cupped” or “clawed”) shingles mean that moisture has gotten under the shingles or that the singles were installed incorrectly. Curving also occurs because over time asphalt on shingles naturally shrinks. Curled shingles are problematic because they can allow more moisture to seep through and get into your home. They also detach easily from the roof, and granules more easily wash off them. If large numbers of shingles are curving, your roof is at the end of its useful life. Individual shingles can crack if they’re exposed to blunt forces, such as a fallen limb or large hail. 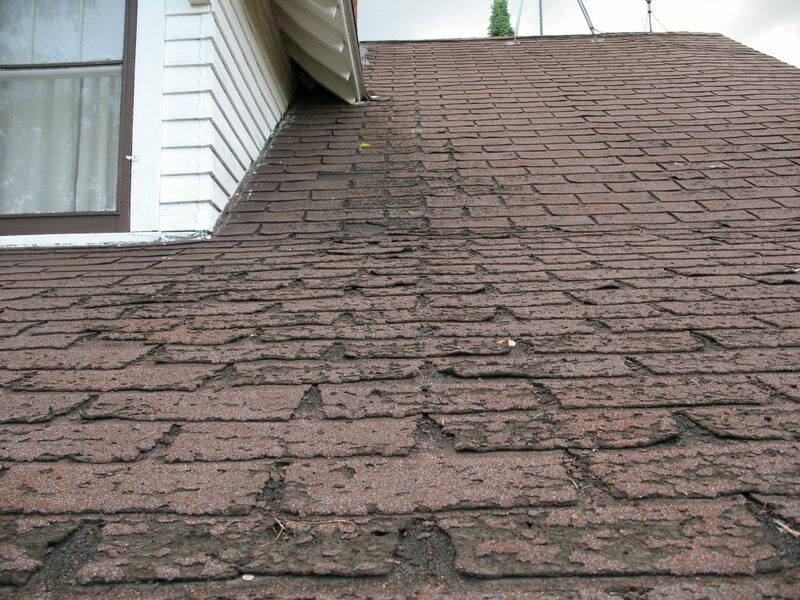 If a shingle cracks, it can come loose and leave an exposed area on your roof, inviting further damage. The damaged shingle may also simply let water in through the crack. Shingles similarly can loosen when exposed to forces such as high winds. Sometimes shingles will also come loose when improperly installed. For whatever reason they come loose, you should replace cracked and loose shingles. These shingles may also be a general sign that your roof has aged and needs more comprehensive attention. Perhaps you haven’t noticed loose or cracked shingles, but you have noticed some shingles are missing. Shingles do fall off sometimes during storms. Missing shingles are a sign that there may be further damage to the roof. Contact a roofing contractor to help you determine the extent of the damage. If your roof is more than 20 years old or if it looks old and worn, you should consider having a roofing professional inspect it. Even if it’s rated for more than 20 years, many factors can accelerate its aging. These factors include storms, intense heat and cool, poor ventilation, etc. You’ll want to replace your roof before it begins leaking and before structural damage occurs. A roof with more than two decades of exposure is a prime candidate for replacement. When your roof has aged significantly or has been compromised, water will get underneath it and can significantly damage the underlying structure. Beams and roof boards will rot, causing the roof to sag. You can discover structural damage, too, if you stand on the roof and notice a springy feeling. Roofs should feel firm, not springy. If your roof feels springy or spongy, inspect the roof structure and contact an inspector. More than the roof may need replaced. If you notice water stains around the roof in your attic, it means water is penetrating your roof and getting inside. Over time, the moisture can rot the wood, and it invites mold to colonize your living space. When you begin having to pull out pots and pans during a rainstorm, it’s a sign that you need your roof replaced. The roof isn’t doing its job because water is getting through. It’s time to call a professional. It should go without saying that if you can see the Greenwood Mall through your roof that the roof needs replaced. Water, insects, and animals can all enter through cracks, and drafts will reduce your home’s energy efficiency. Your roof, in this case, needs immediate attention.